We recently had a request from a reader to create a set of pretty paper fern leaves. We thought it sounded like a great idea so here they are! These metallic paper fern leaves make a gorgeous handmade addition to your holiday home decor. Cut on a variety of blue, green and copper papers, these paper fern leaves look great grouped together in a selection of jars and vases. 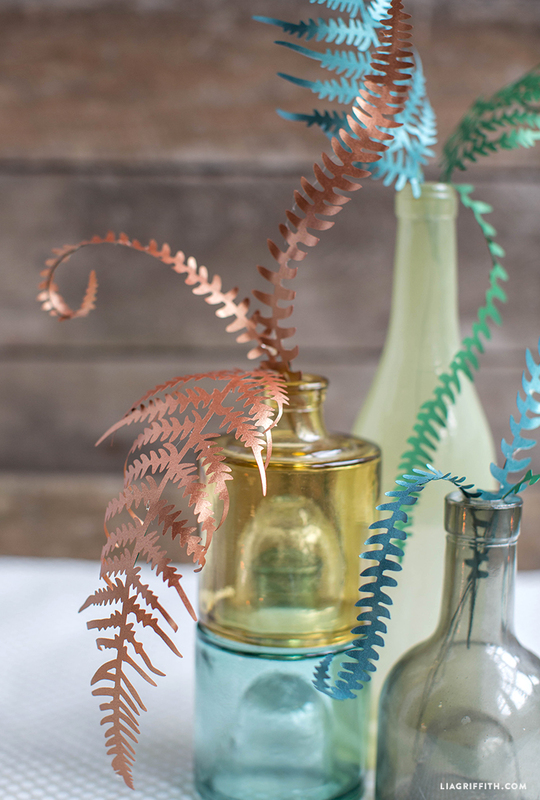 If you have a cutting machine you can make these pretty ferns by clicking on the SVG file below and cutting onto your chosen papers. If you want to cut by hand then you can download the PDF, print out the templates and cut with a craft knife. We curled our paper leaves slightly with our scissors then added a length of floral wire to the back stem of all of our leaves. This allows you to move and bend the paper fern leaves in a way that looks and feels quite natural. 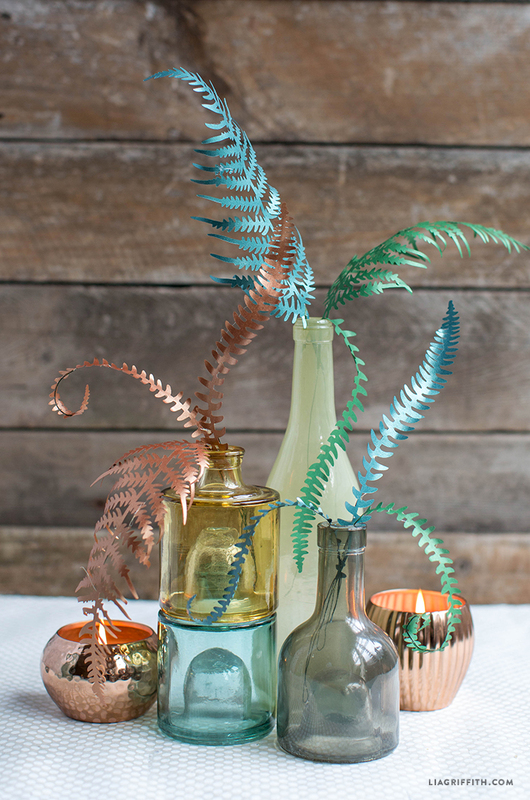 These pretty ferns look great as a tablescape on their own or can be added into a bouquet of our other paper flowers. I am having trouble getting this SVG file to work with my maker. It wont load in the “Make it” phase. While all other files are working correctly. Is it just me? Oh no! I double-checked the file and don’t see anything on our end that would be causing the problem. Could it be an internet connection issue? Cricut’s customer service should be able to help you if it’s a software problem. So I contacted Cricut and even they couldn’t get the file to work. We even tried to convert it to PNG and cut it that way. Is there another fern cut file I can access through a different project? Because this file is the only one I am having an issue with. Hi Lia. I actually have the same issue with this particular file. I’ve been making the Pacific Northwest Bouquet with no issues for most of the last few days but came upon this last detail for more filler and it won’t work either! I will have a go with the files you listed. 🙂 Thanks for the workaround! That is so bizarre! I’ve checked the files a few different times and on different web browsers, but haven’t had trouble. I’m sorry! Hopefully the other files work just fine??! Can you tell me how you attach the wire to the back of the fern please? Or is it the same like this thin metal foil you can buy there ? If so it goes by Metal Foil in Germany . I’m sorry metallic paper is so hard to find! It’s not the same as metal foil, it’s just a shimmery text or cardstock weight paper. If you’re able to buy it online, follow the links at the bottom of the post! alone. Thanks for the information. One of my coworkers, who I actually like, is having a new house built. They hope to move in sometime in December or January. I’m going to make her a house warming/Christmas gift of paper roses using your design. I wanted to add another type of plant leaf. I was going to use the boxwood, but then I came across this. Thank you so much for creating and sharing such great designs! Wonderful, that will look gorgeous!! Feel free to email a photo or two to hello@liagriffith.com and we can feature it on our page 🙂 We love seeing our designs in action! WOW! this is super cool 😉 really beautiful.